Welcome to my holiday cocktail hour!! Normally I don’t drink too much alcohol except at holiday time or at parties, otherwise I can do without it, but one thing I can’t turn down is a good mojito. Besides all the foo foo drinks, mojitos are my favorite!! 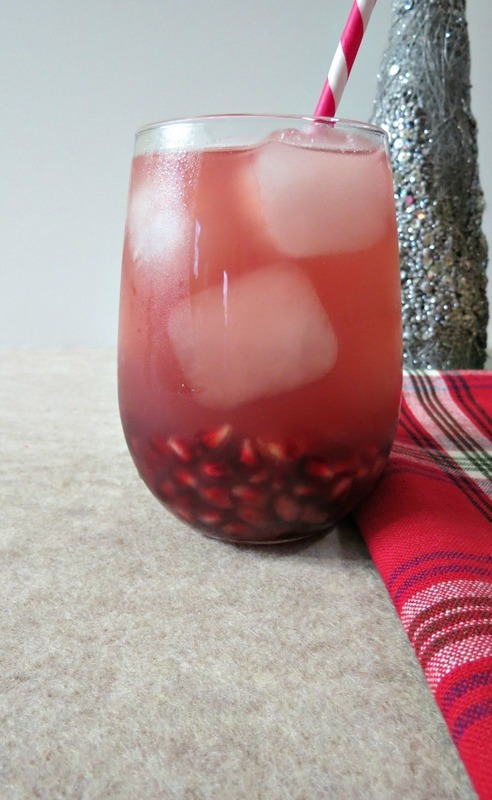 My Holiday Pomegranate Mojito is made with Pom Light Pomegranate Juice, Bacardi Rum, lime juice and Champagne. It tastes amazing! I am so loving the champagne, it gives it a nice light fizz. The drink in general is light, fresh, slightly sweet, with a slight pucker from the lime and a sweet bubbly feeling in the belly from the Champagne. Honestly, I am horrible at describing foods or drinks, though I do try my best. 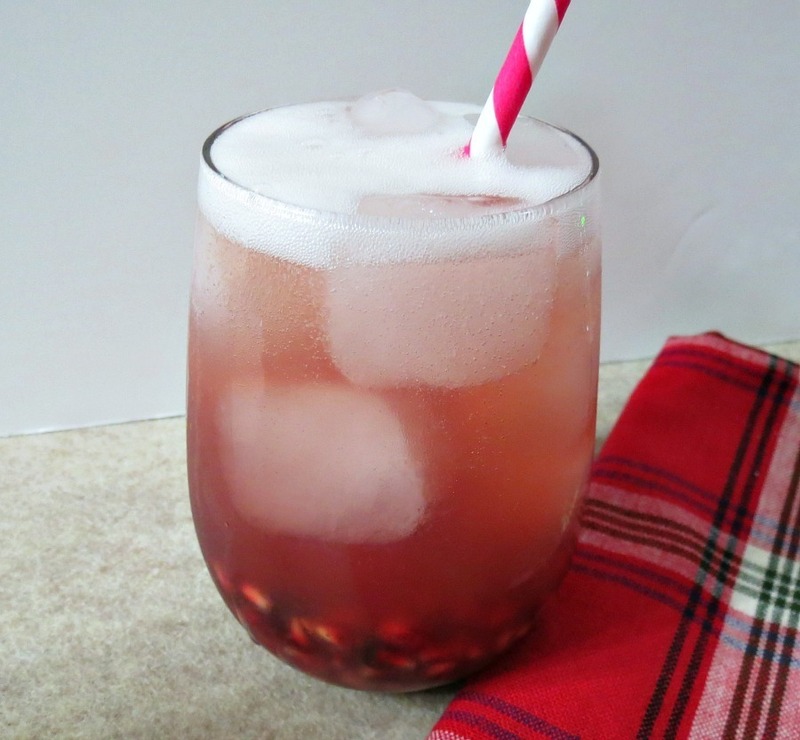 To add a little festivity to the drink I filled it with Pomegranate Arils and a pretty pink straw. This drink is pretty light compared to most cocktails. Actually out of all the mixed cocktails out there, mojitos tend to have the least amount of calories. As a rule of thumb, when you do go out for a drink, be sure to order a drink with clear alcohol. Clear alcohol tends to have the least amount of calories. Try to stay away from drinks like margaritas, daiquiri’s and pina coladas. Those one’s have the most calories. Figures, because next to the mojito, they are my favorite! 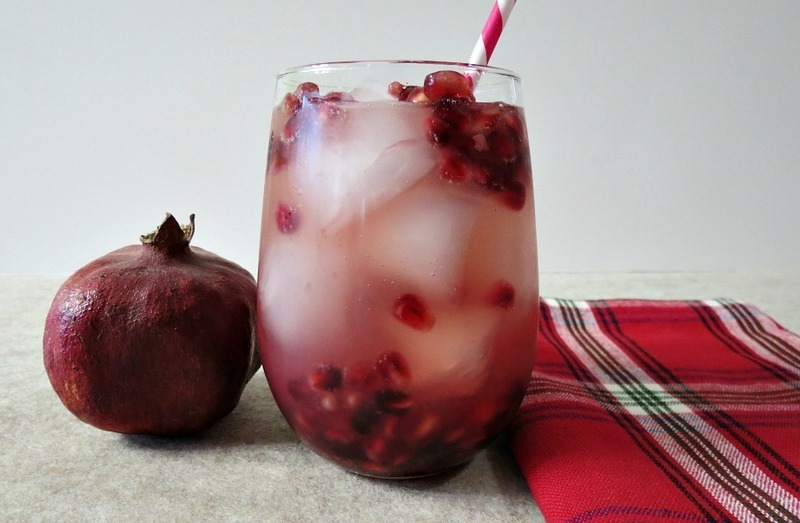 A light and fresh tasting holiday drink made with pomegranate juice, rum, champagne and topped with pomegranate arils. 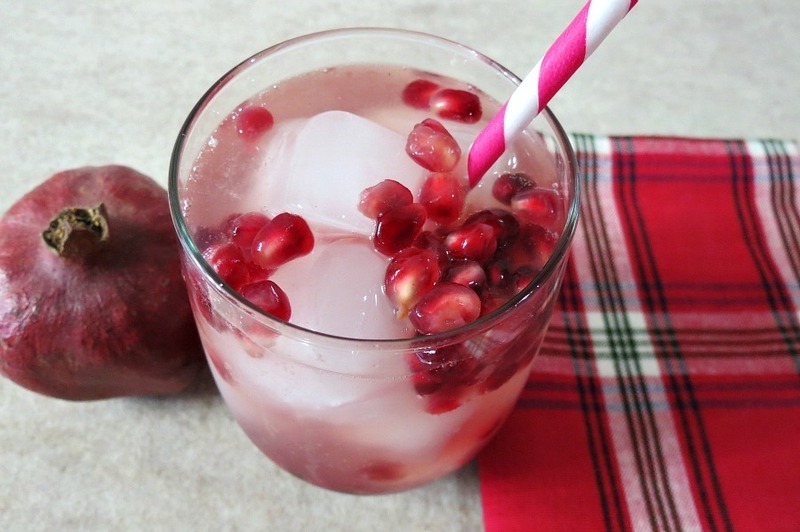 In a glass add pomegranate juice, lime juice, rum and sugar, mix well. Fill the glass with ice cubes and top it off with the champagne. Top with Pomegranate arils. Eat a light snack before going to your party, have something like yogurt, an apple or banana with peanut butter. Stay away from the food table, grab a little plate of some healthy goodies and walk away. Don’t hang out at the table!! Stay away from fatty foods such as eggrolls, crackers, potato chips, pigs in a blanket and heavy dips. If your going to have dessert, have a good one and savor it. Don’t reach for an after dinner chocolate, cookie or pastry. You had your dessert, put the plate down and stop eating for the evening. Keep your hands busy (don’t be dirty minded) by holding your drink in one hand and say a purse or a camera in the other. Keep your hands busy, keeps it off the food table. You tend to eat more when you drink. Sip your drink slow, enjoy it. Don’t gobble it down, savor every drop! 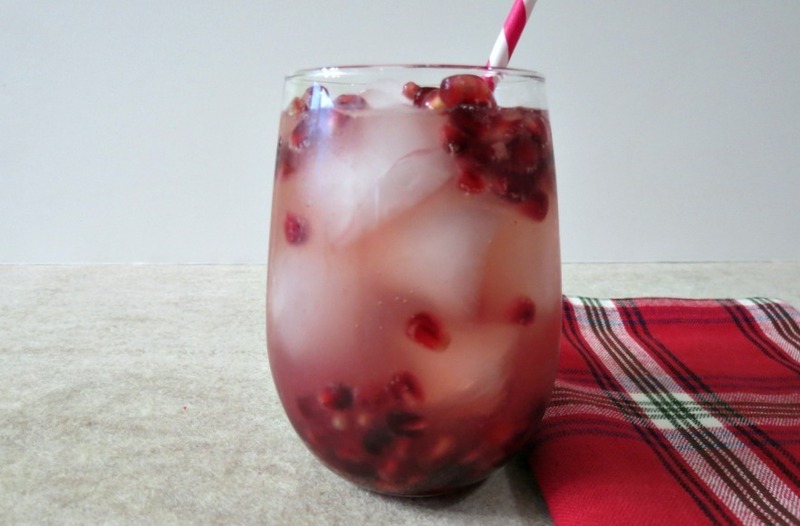 Drink sparkling water, it keeps you full and hydrated, put a squirt of lemon in it or dress it up with some fresh cranberries. Most of all have fun! Enjoy the company of your friends and family, it’s about them, not the food! Oh one last thing! My Holiday Mojito is a drink for people over the age of 21. When you are away from your home and at a party, restaurant or bar, and you do chose to drink, please be sure to call a cab or have a designated driver in your group. It’s better to be safe and sorry!! One last piece of advice, if you do drink too much, an easy cure for a hangover is to drink coconut water! That is from experience. I drank to many cosmos one night, and when I got home I drank coconut water and I did not have a hang over and felt perfectly fine the next day! Mojitos are really the only cocktail I truly enjoy..and I know I’d ADORE this pom version!! Also loving your skinny holiday tips. I need to work on not hanging around the food table! Girl, I need to not hang out at the holiday table. It’s easier said then done, but I do try! Like you I only drink at parties and holidays too! But every once in a while I like to have a holiday drink. It’s Mimosas on Christmas morning and I’m done for a while! Great recipe. Looks so refreshing. Thanks for sharing. YUMMY! I’d love you to come link up at my Pin Me Linky Party. Thanks for linking up. Following via Facebook, Twitter & Pinterest now. Thanks for the invite!! You already know I linked up! that’s a very good trick thank you …. i will always remember to hold my phone and stay away from table …..